Is anyone even mad anymore? The Bears just got spanked by a Brett Favre-quarterbacked team 36-10. The loss all but eliminates them from playoff contention, yet, because these Bears have been so bad for so many consecutive weeks -- remember, this is the same team that lost to the Bengals 45-10 -- few people seem all that worked up about it. The Monday Morning Quarterbacking is angry, sure, but it's not nearly as angry as the circumstances should dictate. Your 2009 Chicago Bears: So bad they can make one of the country's great fan bases downright apathetic. Still, though, there is plenty of blame to go around after a loss like that, and the usual Chicago media suspects didn't waste time allocating it. The Chicago Tribune's David Haugh notes that Brett Favre took advantage of the Bears' strategy to put an extra defender or two on the line of scrimmage in order to stop Adrian Peterson by throwing right over the Bears linebackers and secondary. Per the usual, the Tribune's Steve Rosenbloom wants to fire everybody, yesterday. This time he actually writes the words "fire everybody," which would be particularly powerful had Rosenbloom not been writing the same blog post every day for about three years now. Meanwhile, Dan Pompei thinks the Bears need to play better around their young quarterback, and given the way the offensive line failed to protect Cutler, and the way Matt Forte has failed to create anything positive on the ground, and the way Cutler's receivers failed to run their routes ... yeah, we'd say that's pretty much the case. The Sun-Times's Joe Cowley unintentionally writes a counterpoint today, arguing that Brett Favre's postgame assertion that Cutler needs more help and more patience is wrong. 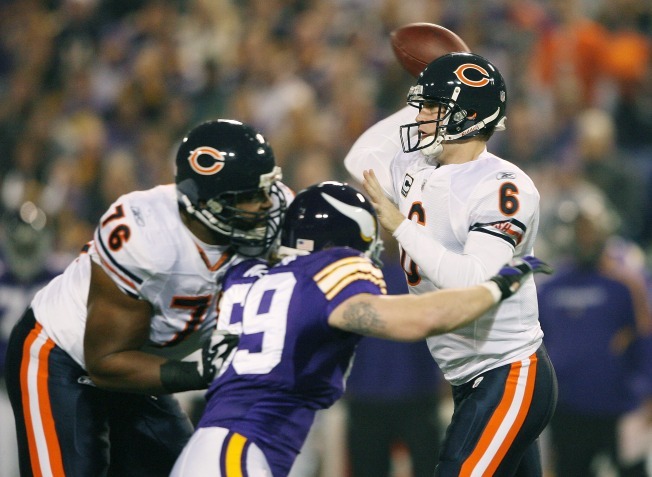 Brad Briggs' postgame piece focuses on the Bears' playoff hopes, which are now all but dashed. The current Bears losing streak is tied for the longest of Lovie Smith's tenure. Mike Mulligan addresses that tenure directly, saying the Bears coaching staff is in even more trouble after such a lopsided loss. And finally, the usually apoplectic Windy City Gridiron is oddly demure today, writing that Bears fans should be disappointed but not surprised. If anything, the loss "should just bring us one step closer to seeing change in Halas Hall," which is apparently the Bears new endgame. Told you the Bears could make you apathetic.